The Bellagio Gallery of Fine Art museum exhibits superb art and the fountains at the Las Vegas hotel casino draw huge crowds for the water show. The gallery is located within the Bellagio Hotel Casino. Image size is about 10x14 inches(27x36 cm) printed on 11x17 (28x43 cm) inch 100% acid free premium paper. The prints sent to your home do not have the watermark. Please check here to find out more about my guaranteed customer satisfaction on the art purchased from me. After my most recent visit to the gallery, my wife and strolled out the front of the hotel in time to see the spectacular Bellagio water show set to music for all to hear. We looked across the lake toward the Paris Las Vegas Hotel and its Eiffel Tower. The temperature outside was still very hot but that did not stop the crowd, as they stood shoulder-to-shoulder watching. My favorite time to see the fountains is evening because the lights make the water jets look even more impressive. On this visit the sun was setting so the water lights were not a factor. What drew me most to the scene were the throngs of people lined up along the lake to see the show. The sun was gleaming off the Paris Hotel across the street. It was a beautiful scene and the crowd loved it. I took a picture of that sight and made it into the artwork shown above, now available in premium paper editions. 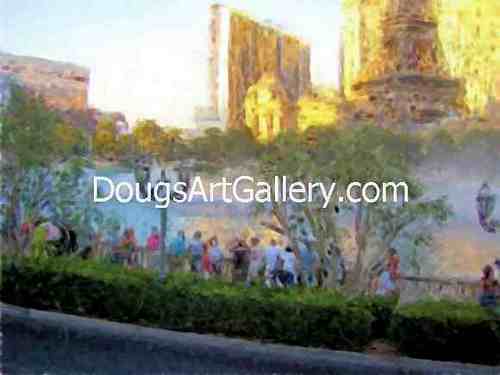 The Bellagio Gallery of Fine Art is located within the Bellagio Hotel Las Vegas. Just in case you are not familiar with the Bellagio, this hotel is over the top fabulous and is considered one of the best, if not the best, hotel in Las Vegas. There are a lot of hotels and casinos to visit on the strip and the Bellagio is well worth the time. Usually there is an admission fee for the general public to see the artwork but the Gift Shop next to it is free. Inside the gallery you can expect to view examples of paintings, sculptures and other works by some of the world's most influential and renowned artists. The admission fee is similar to the admission price of most museums but to be fair, this gallery is rather small in size compared to any major art museum. The good news is that it makes up for its size with very good quality art in every one of its exhibits. The Bellagio Gallery of Fine Art is used to host private parties and other functions not open to the public so it is advisable to call ahead for viewing times during your visit to the city. Ticket Information is available by calling 1-877-957-9777 or 1-702-693-7871. Sunday - Thursday: 10:00 a.m. - 6:00 p.m. These museums have world famous paintings by artists like Cezanne, Matisse, Caravaggio, and Picasso. To check out other artwork by Doug Dourgarian and see more links for his online art gallery click here for his web gallery of art . Click here to leave Bellagio Gallery of Fine Art for more links to artists and their online art galleries, prints and posters. Browse the links found at the bottom of Home Page.